+View Offer Details1 available at this price. Stock #K3B63295. 36 Monthly payments of $284. Total due at lease signing $2,999. No security deposit required. MSRP $28,995. Cap cost $27,920. Cap cost Reduction $2,715.11. Residual $17,686.95. Total lease charge $13,289.11. Acquisition fee $925. Lease and termination fee $350. On approved credit, min 700 FICO score. Based on 7,500 miles per year, excess miles charged at 25 cents per mile. Plus license and title and $115 title and registration processing fee. FINANCE: 3.49% APR Financing for 72 months on all new 2019 Countryman Models. Monthly payment of $15.41 per $1,000 borrowed. On approved credit, min 700 FICO score. Cannot be combined with any other incentive. Financing for well-qualified applicants only. Length of contract is limited. Subject to credit approval, vehicle insurance approval and vehicle availability. A 0.5% state sales tax will be added to new vehicle sales. Offer expires 04/30/19. Available ALL4 all-wheel drive is the heart of this new MINI model's off-road ready design, helping you manage the traction underneath you regardless of what the weather may look like or how slick the surface happens to be. Enjoy travel over uneven surfaces, hilly terrain and altogether unpredictable landscapes with this intuitive control. Choose a TwinPower Turbo engine from the lineup of dynamic powertrain options for the 2018 MINI Countryman and take off into the unknown with a renewed sense of confidence. With the top engine generating 228 horsepower and a zero to 60 miles per hour time of slightly over six seconds, you can match a boldly styled vehicle with a dynamic driving experience. Drivers value different things, with some preferring less trips to the pumps and others enjoying more rugged power from under the hood. You can enjoy either of these options, or combine the two qualities, with three different drive modes to access. Sport, Green and Mid provide an emphasis on performance, fuel economy or balance respectively, allowing you to customize your ride as you move along. With seating that comfortably accommodates five different passengers and extra cargo room to spare, you will see how the theme of versatility for the MINI Countryman spreads to the interior layout. The 40/20/40 split-rear seating allows you to transition the cabin as you please, depending upon cargo room you may require or the company you keep. Serving Portland, Vancouver WA, Beaverton, Lake Oswego, and Hillsboro. Looking for a great deal on a one-of-a-kind SUV? 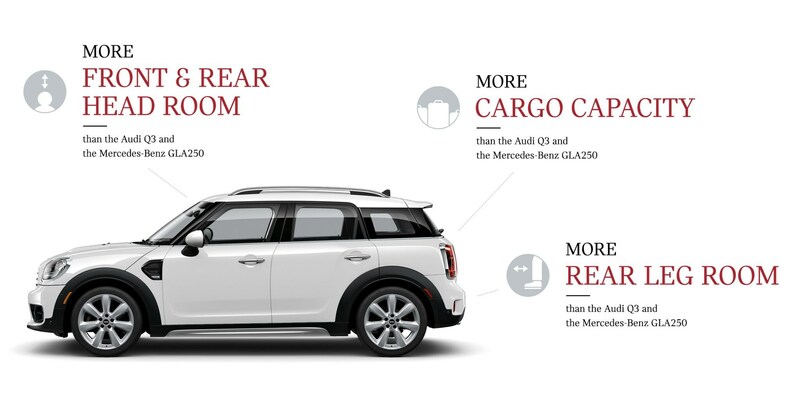 Come to Mini of Portland and shop our special offers on the 2019 Mini Cooper Countryman. The largest of the Mini vehicles, the Countryman is a crossover with a classic, eye-catching design and engaging driving dynamics. Its richly tailored interior seats five and has generous cargo space. The 2019 models have new headlights that light up in a full LED circle ring and tail lights that display a Union Jack pattern when fully lit up. Drivers in the Portland and Beaverton, OR areas will also like the added power available with the Countryman's new TwinPower turbo engines. A plug-in hybrid is also available for better fuel economy. The 2019 Mini Cooper Countryman has better handling than most subcompact SUVs, and it delivers poised handling on winding roads. Front wheel drive is standard, but all-wheel drive (which Mini calls All4) is available. It has selectable modes that let you tailor driving dynamics to your liking. Three different engines are available with the Mini Cooper Countryman, including a 3-cylinder, 1.5 liter that produces 134 horsepower, a 2.0-liter 4-cylinder engine delivering 189 horsepower, and a 1.5-liter inline 3-cylinder hybrid that makes 221 horsepower. With the 2.0-liter engine, the Countryman can go up from 0 to 60 in just 6.2 seconds. With the hybrid engine, you can get an EPA-estimated 65 mpg combined highway and city. When you look inside the 2019 Mini Cooper Countryman, the first thing you may notice is its unique-looking round center display screen that's circled with LED lighting. People in the Lake Oswego and Tualatin, OR areas who like to stay connected on the road will appreciate that Apple CarPlay comes standard in the new Countryman, for access to Apple Music, maps, hands-free phone calls, and text messages. A panoramic sunroof comes standard to brighten up the cab and give you a better view of the outdoors. Navigation with real-time traffic is available with the Mini Cooper Countryman to help you find where you're going and get there on time. An available hands-free Comfort Access keyless entry feature lets you open your front doors just by having the keys with you, in a pocket or bag. You can also open the rear tailgate with just a swipe of your foot under the rear bumper. Safety is a necessity, and the 2019 Mini Cooper Countryman keeps you protected in an accident with adaptable airbags that modify inflation based on the severity of the impact. People in the Hillsboro and Vancouver, WA areas will be glad to know that a rearview camera and rear parking sensors also come standard to assist them with safer driving. Optional safety features include forward collision warning, automatic emergency braking, park assist, a head-up display, driver drowsiness monitoring, and adaptive cruise control, which helps you maintain a consistent speed between you and the car ahead. The 2019 Mini Cooper Countryman is a spirited subcompact SUV with a posh interior, comfortable seats and excellent safety ratings. Drivers in the Portland and Beaverton, OR areas can find a wide selection of Countryman SUVs at Mini of Portland. Financing is available, and you'll want to be sure and check for any exclusive offers that may be available. Visit us and test drive one today.